Parents of adolescents have the opportunity to learn successful parenting strategies at a Parenting the Love and Logic Way course geared for families with children from age 11 to 17. Offered by Lee’s Summit CARES, the sessions will be from 6:30 to 8 p.m. Wednesdays, Feb. 20 through March 13, at Summit Lakes Middle School, 3500 SW Windemere Drive, Lee’s Summit. As some of the more than 800,000 federal workers going unpaid reside in the cities of Lee’s Summit, Lone Jack, Lake Lotawana and Greenwood, local assistance agency Lee’s Summit Social Services is bracing for the likely uptick in requests for food and financial assistance. In fact, in just the last week, LSSS Executive Director Matt Sanning said his organization has received 15 requests for assistance from furloughed government workers. Summit Christian Academy will host the 2019 Kansas City Area Christian College Fair, sponsored by the North American Coalition for Christian Professionals (NACCAP). Lee’s Summit CARES is presenting a one-hour workshop focusing on understanding, preventing and reversing the effects of childhood trauma. Called Trauma Informed Care: Developing Resilience through Education and Mindfulness, the course will be offered from 6:30 to 7:30 p.m. Feb. 13 at Summit Ridge Academy, 2620 SW Ward Road, Lee’s Summit. Summit Christian Academy recently recognized students who consistently exhibit exceptional Christian character through the Christian Character Award program. The City of Lee's Summit Parks and Recreation Department, in partnership with local non-profit Urban Trail Co., is bringing new trails to Legacy Park. These natural-surface, single-track trails for mountain biking, hiking, and trail running will be located along the northern and eastern portion of Legacy Park. A section of Southwest Ward Road will close Jan. 23, and will remain closed until June 2019, as the City of Lee’s Summit makes road improvements. After this first phase of construction, additional closures of Ward Road will follow through September 2019. In 2019, the City of Lee’s Summit will be working with Property Reserve, Inc. (PRI) to master plan 4,000 acres of undeveloped PRI property not previously available to the market. The land is in two large tracts located within the city limits. Lee’s Summit CARES will offer its popular Parenting the Love and Logic Way course from 6:30 to 8 p.m. Thursdays, Jan. 24 through Feb. 21. Designed for parents of children of all ages, the class will be at Great Beginnings Early Education Center, 905 NE Bluestem Drive, Lee’s Summit. 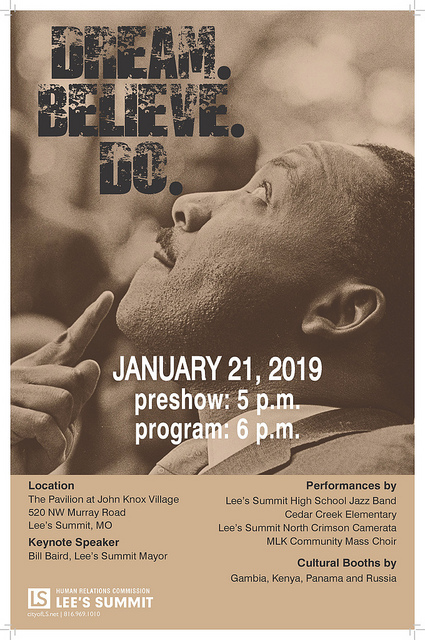 The City of Lee’s Summit will honor the life and legacy of Dr. Martin Luther King Jr. at a free community-wide event Jan. 21 at 6 p.m. in The Pavilion at John Knox Village, 520 NW Murray Rd. In January 2015, Randi Perry’s college experience was unexpectedly cut short when she was seriously injured in an automobile accident while commuting from Independence to the University of Central Missouri (UCM) Warrensburg campus. Everyday heroes from throughout the community will be honored at the annual Mayor’s Character Breakfast, scheduled from 7 to 9 a.m. Jan. 24 at the Pavilion at John Knox Village, 520 NW Murray Road. The popular annual event, hosted by Lee’s Summit CARES, typically includes a sellout crowd of close to 700 attendees. Adults interested in starting a new career in a growing field with a good salary are encouraged to check out the Career Certificate Program, offered through the University of Central Missouri’s (UCM) Lee’s Summit location -- the Missouri Innovation Campus. Lee’s Summit CARES is tackling an important topic for families in today’s constantly plugged-in world at a one-hour workshop called Screen Time and the Developing Brain.